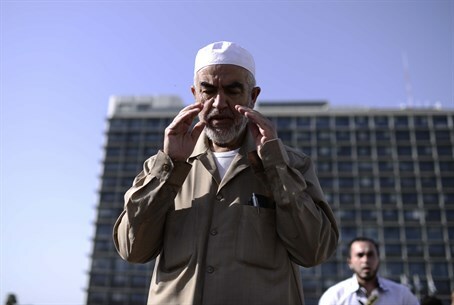 Sheikh Raed Salah, head of the radical Islamic Movement in Israel, has called for terrorist violence on the Temple Mount - the holiest site in Judaism - so as to prevent Jewish access to the holy site. Referring to peaceful Jewish visits to the site - which are often met with harassment, most recently witnessed on Sunday during the Tisha B'Av fast which mourns the destruction of the First and Second Temples at the site - Salah spoke of Israeli "attacks" against the Al-Aqsa Mosque on the Mount. Salah vowed that his movement, which has been actively stirring up riots on the Mount, will stick to its goal, summarized as: "our lives and blood we will sacrifice for the Al-Aqsa Mosque." "Every breach of the Israeli side against Al-Aqsa is a breach of the occupation, whether done in military or religious uniforms or under political cover," said the radical Israeli sheikh, indicating religious Jews are targets as well. "We must go out against all these breaches until the occupation is removed." Partially due to statements like these, Salah has been forbidden from visiting Jerusalem from June 25 up until this December out of fears he would further fan incitement. Problematically the Mount has been left in the hands of the Jordanian Waqf ever since being liberated in the 1967 Six Day War, and as a result it has been the site of recurring Muslim riots meant to block Jews from entering the site. Likewise the Waqf has forbidden Jews from praying at the site despite Israeli law stipulating freedom of worship. Salah said the "occupation" aims one day to enforce its sovereignty over the Temple Mount, commenting, "that's an illusion, which is empty and they (the 'occupation' - ed.) have no authority and legitimacy, and its path will certainly disappear, and Allah willing it will happen soon." Arab sources have long tried to deny the Jewish nature of the site in various campaigns, by among other things destroying ancient Jewish artifacts and building illegally. "The occupation has declared war against Al-Quds since the start of the Zionist enterprise in the 18th century (CE), and now it is conducting terrorist aggression based on the evil statement: there is no value to Israel without Jerusalem, and there is no value to Jerusalem without the Temple Mount," said Salah, concluding with a call to "liberate" Jerusalem. Salah has been in a legal battle over his incitement to use violence to block Jews from visiting the Temple Mount, making calls to racism and violence that have led MKs to launch a bill to outlaw Salah's movement. The sheikh has labeled Israeli leaders “terrorists” and “enemies of Allah” in a speech to Muslims in Be’er Sheva, and was also jailed for five months in 2010 for spitting at an Israeli police officer. During a speech at a 2007 demonstration he accused Jews of using children's blood to bake matzah, invoking the infamous medieval blood libels used to trigger murderous pogroms in both Europe and the Middle East. Salah also spent a brief period in jail for transferring money to Hamas, and famously "reminisced" fondly over the drawing of swastikas as a child in a 2009 interview with a London-based Arabic-language TV station.